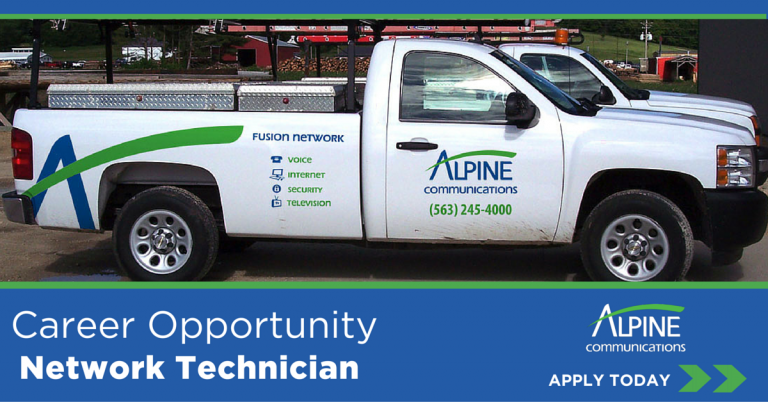 Located in Elkader, Iowa, 15 miles west of the Mississippi, in beautiful Clayton County, Alpine Communications offers local telephone, long distance, wireless, broadband internet access, cable TV and home monitoring service. Candidate should have the knowledge and skills usually acquired through a telecommunications or networking degree or experience in a similar capacity. The successful candidate should demonstrate strong analytical and problem solving skills. The candidate will enjoy working outside in our communities with our customers and utilizing technology to enhance the businesses and people we serve.